The latest installment in the home improvement saga was completed over the weekend: we have a new laundry room floor. The old floor was an uneven mashup of three different sizes and styles of tiles, and since we keep the cats’ litter boxes in the laundry room, the cracks and spaces in the mismatched tiles were always filling up with litter particles. 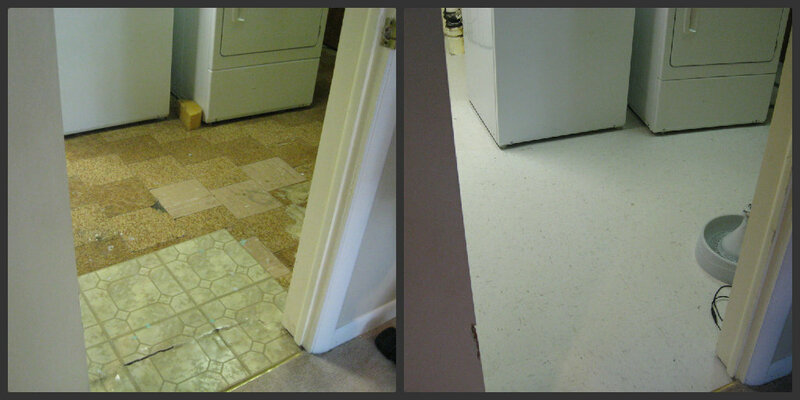 We chose a plain vinyl tile for the laundry room, because ceramic tiles didn’t seem worth the expense. It’s hard to see from my photo, but the new tiles are white with some small grey and blue flecks. This will be so much easier to keep clean, and it looks much less chaotic now. I’m delighted with how it looks. The tile guy spread some goo down (I didn’t ask what it was) to even out the floor’s surface so he could put the new tile over the old stuff. Because of how many layers of tiles were in there, and the extra expense involved in pulling everything up, we just decided to add a layer, so I guess some future owner will get a fun surprise if they ever pull up this new floor! The edges still need shoe molding put in, but this guy wasn’t told about that, so he had none with him. When we asked the boss guy about it on the phone, he said no worries, the carpet guy would take care of that later. I have a feeling the carpet guy will have as little clue about it as the tile guy did, but we’ll see. But you know that’s not the end of the story. No home improvement goes unpunished in this house. And I’m not even talking about Horton walking through the goo and getting his paws absolutely covered in it, although that was fun to fix. A soapy wet washcloth worked well to get it off, but without Dave handy to pin him, I never would have managed! Angry cats are squirmy! After the tile guy finished up and moved our washer and dryer back in, he discovered that the dryer vent duct wouldn’t fit onto the connector on the back of the dryer, because the extra height to the new floor raised the dryer up a teeny fraction of an inch. Why the dryer was attached to a rigid vent line, I have no idea, but it means that it has to be exactly the right length, not too long or too short, or it won’t connect to the dryer. Tile guy shrugged and basically said it wasn’t his job to figure it out, which left it to us, the handy homeowners. Since cutting it to the new precise height seemed a risky and unnecessarily complex task, I just forked out $20 at Home Depot for a twenty-foot flexible dryer vent tube so we could have a little leeway. Dave cut the rigid vent about three feet from the dryer with a pair of snips, and then attached a length of flexible stuff to the end, taping it in place. Which you would think means I could do laundry now, right? But when I ran a load of laundry the other night and went to transfer it to the dryer, the clothes in the washer were steaming hot! I always wash and rinse in cold water, so this means that the tile guy hooked it back up backwards. I never even thought to check that, although I did take a second and make sure nothing was leaking when I first started the washer. I’m really hoping that I didn’t just shrink all of our clothes. Dave’s favorite shorts and my “Stand back, I’m going to try Science” T-shirt were in that batch. This entry was posted in Uncategorized on August 2, 2012 by antijen. Oh man, I’d be SO furious to find out the stuff was reconnected wrong that way! I hope everything comes out okay.